The Super Mario Games are tautly structured sets of rules. That’s what makes them enjoyable and even beautiful at times. You see objects you can jump over them. Blocks you can smash. Enemies that affect other enemies. Within minutes, the order of things is set. You’re bounding through a world of systemic cartoon beauty. Every symbol is clear to you--if something has eyes, it’s probably sentient, and although that’s disturbing in its own way, it fits into the world and you move on. It’s a desert. 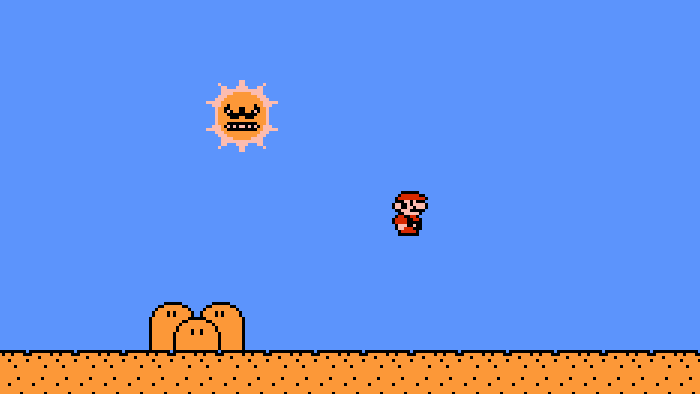 You can tell it’s a desert because of the sun that is literally glaring down at you, frowning. 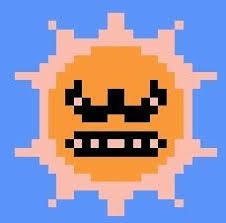 You can tell the desert is hostile because even the sun hates you. Cartoon logic made manifest. There are rules, after all. There are supposed to be rules. Rules that are willfully broken when the sun itself untethers itself from its perch in the sky, and defying perspective and logic, charges at you. It hunts you, and kills you with its deadly touch. There are many moments of tension in the Mario games. But for the mind-bending terror of a celestial body bringing things to a personal level, few things in the 8-bit era match this moment for terror.